Actress Elizabeth Tulloch and her husband, David Giuntoli, recently welcomed their baby girl! I had the pleasure of getting an up-close and personal glimpse into the nursery right from the start. I spoke with Elizabeth while she was still pregnant and starting to plan the nursery, and she had some amazing ideas. 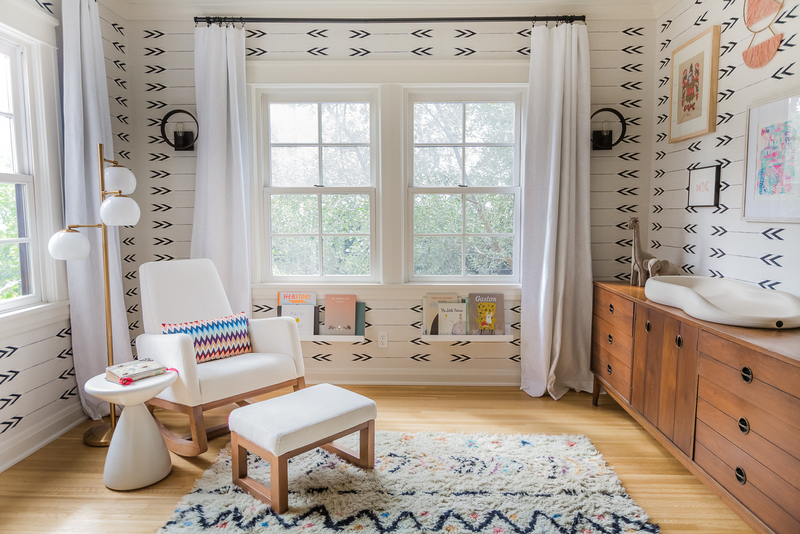 Elizabeth and David’s home has elements of modern, vintage and mid-century. 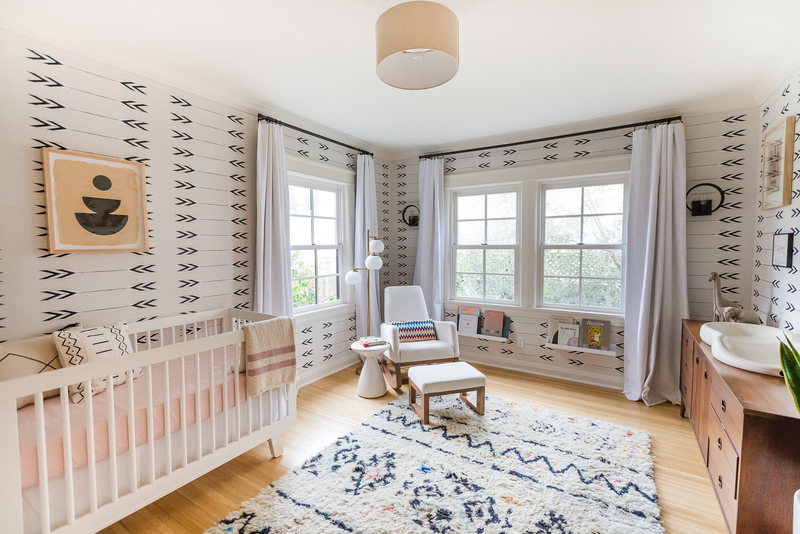 She wanted to bring that into the nursery as well and then sweeten it up a little with some blush pink accents (but not too many!). She knew right away that she wanted to use Cavern Home’s Tapestry wallpaper. It’s a high contrast pattern that makes a bold statement! 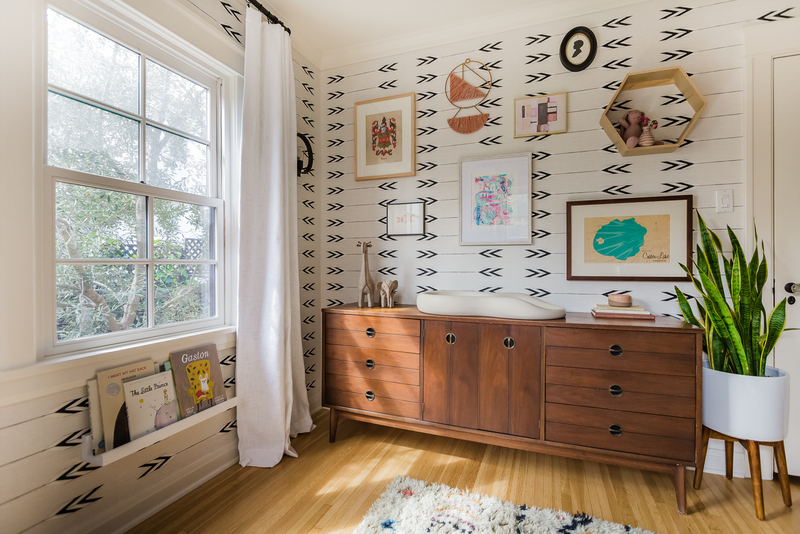 When it came to furniture, she already owned a vintage mid-century modern piece that she repurposed as a changing table which really adds character and charm to the room. The rocker was an important piece, and Elizabeth really wanted something modern, comfortable and easy to clean. She chose the Monte Design Joya Rocker (my all-time favorite brand) and the matching ottoman. The walnut wood base on the pieces really brings out the wood tone of her dresser—not to mention the amazing Missoni print pillow! One thing that Elizabeth asked me about was how high to install the curtains. The curtains were originally hung right on the actual window molding (this is fairly common in homes of this style). I always suggest hanging curtains as high up as they go to make the room feel larger. It also helps keep any extra light out. It required some extra effort, but it really makes a difference in the space.